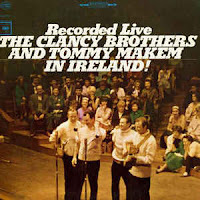 The Clancy Brothers and Tommy Makem, "Finnegan's Wake"
James Joyce's Finnegan's Wake, reckoned one of the most difficult books to read, took its title and a tiny bit of its narrtive from an Irish comic ballad, author unknown, first heard in the 1850s. It tells the story of a bricklayer who, having had "a drop of the craythur" before work, falls from his ladder and dies. At his wake, "a row and a ruction" starts, until whiskey spills on his corpse. This revives him. Bygmester Finnegan, of the Stuttering Hand, freemen’s mau-rer, lived in the broadest way immarginable in his rushlit toofar — back for messuages before joshuan judges had given us numbers or Helviticus committed deuteronomy. ... During mighty odd years this man of hod, cement and edi-fices in Toper’s Thorp piled buildung supra buildung pon the banks for the livers by the Soangso. ... A waalworth of a skyerscape ... entowerly, erigenating from next to nothing, ... with a burning bush abob off its baubletop and with larrons o’toolers clittering up and tombles a’buckets clottering down. Of the first was he to bare arms and a name: Wassaily Boos-laeugh of Riesengeborg. ... Hahahaha, Mister Finn, you’re going to be fined again! ... Hohohoho, Mister Funn, you’re going to be Mister Finnagain! ,,, But Dimb! He stot-tered from the latter. Damb! he was dud.